How comforting it is to know that we will never again walk in darkness, thanks to the love of our God and the death and resurrection of His Son. What are some ways in which you feel comforted by knowing you will never walk in darkness? Prayer: Dear Jesus, how we love you, and how we appreciate that you are the light of the world. 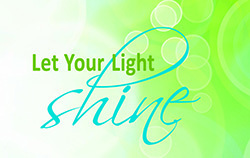 Shine down on us today and every day, so that we can shine on others. We know all things work together for good for those who love God, who are called according to his purpose. – Romans 8:28. Have you ever experienced something related to what this bible verse says? Did something bad happen to you, but God turned it around somehow, using the bad situation to bring about something good? Why is that, do you think? We each have the light of knowledge of God’s glory within us – a wonderful gift from a wonderful God! How can you use that knowledge today to give back to the world? Prayer: Glorious God, you are an amazing God, and we are so very grateful for all you have done for us. help us use the knowledge of your goodness and glory for the goodness and glory of your world. There is no reason to live in darkness. God has called each of us into His wonderful light, to live and love in Him who first loved us. When times are dark, can you remember that God’s light never grows dim? Prayer: Dear God, thank you for flooding us with your love light all the time, everywhere, no matter what. Do not neglect to show hospitality to strangers, for by doing that some have entertained angels without knowing it. – Hebrews 13:2. What are my attitudes towards “strangers”? How do I express the love of Christ to all I meet (rich/poor, citizen/foreigner, Christian/non-Christian, straight/gay, etc.)? Prayer: Jesus, in your human nature, did you ever feel uncomfortable around certain people? or were you just so overflowing with the Spirit that you loved all from the moment you entered human flesh? Whatever the case, help me to love others even more!